We sell our pork as Sides, $100 Sample Packs, Cuts, and made into Sausage Rolls. AVAILABLE NOW: Cuts and sausage rolls are available on Saturdays at the Denman Island recycling centre. Contact us to find out when our next sides will be available. We raise free-range, heritage breed pigs on pasture and forest runs. In 2019, we are raising Large Blacks from Five Sisters Farm. We raise heritage breeds because they have lovely personalities and produce consistently outstanding pork. 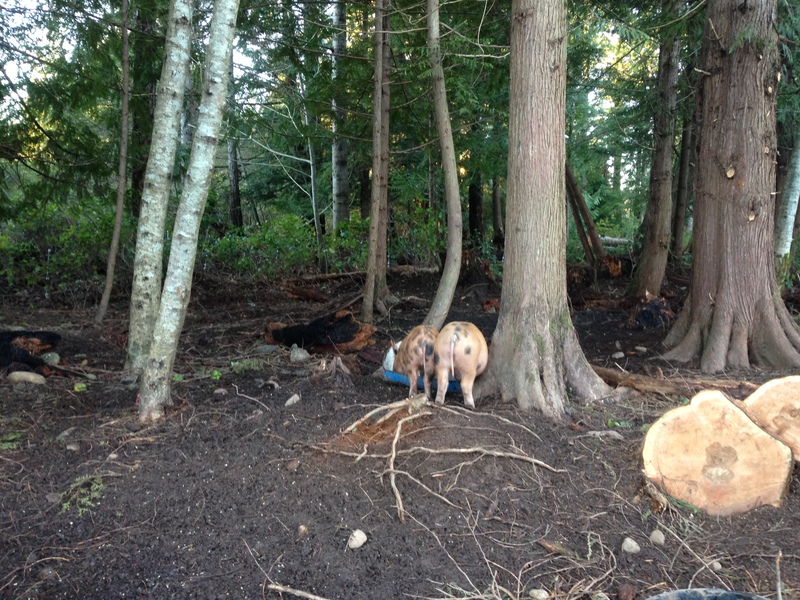 Our pigs eat a locally produced non-GMO, non-medicated feed from Top Shelf Feeds in Duncan, non-meat scraps from our kitchen and the Denman Island General Store, and whatever plants, bugs and slugs they root up in their runs. Our pigs spend their days doing pig things – rooting, snoozing in the sun, ripping apart rotting logs, galloping, and rubbing against trees. We take our pigs to Gunter Bros. Meat Co. for processing, a short drive north of Courtenay. We take them over on the first ferry from Denman, on the same day they will be slaughtered to minimize their stress. This is the most economical way to buy our pork. A side is a half pig.You get half of everything – half the bacon, one shoulder, half the bones (for stock), etc. The pork comes cut, wrapped and frozen, and takes up about 2-3 cubic feet of freezer space.You get some choice as to how your share is butchered and packaged – however, no, you can’t get all bacon! A $200 deposit reserves a side, with the balance paid when the pork is ready at $5.90 per pound hanging weight (usually 85-95 lbs), plus the cost of any curing, smoking and sausage preparation you choose to have done. Buying by the side is win-win for customer and farmer. By purchasing a side, the customer benefits by getting top quality well-raised heritage pork at a very reasonable price. And, we, the farmers, get a bit of income up front to help us cover some of the costs of raising our pigs – purchase price, feed, transport, infrastructure building and repair, and butchering. To know when sides are available, send an email to info[at]tworoadsfarm.ca and we’ll add you to our pork mailing list. Sides can be picked up in Courtenay and on Denman.We will deliver to other locations on Vancouver Island if we have sufficient orders. We make one delivery of sides to Vancouver in the fall. We take reservations for a limited number of Sample Packs. A Sample Pack gives you a variety of different cuts, worth at least $100 – like a taster pack. We ask for a $50 deposit to reserve a Sample Pack. We’ll give you a call when the pack is ready, and you’ll have a week to pick up your pack from the farm or arrange a Comox Valley pick up point. Every pack is slightly different – pick up your pack early to have your pick of the bunch! To know when Sample Packs are available to reserve, send an email to info[at]tworoadsfarm.ca and we’ll add you to our pork mailing list. We sell cuts at farmers’ markets and by appointment at farm gate. Please see our Where To Buy page for more information on which markets we are at. Some of our sausages do not contain gluten – please ask us. Hams, large roasts and unusual cuts are only available by special request. Please contact us well in advance if you would like one of these cuts for a special occasion. Our prices reflect the fact that we are raising small groups of heritage breed pigs in outdoor runs. If you have questions about our pigs, pork, prices, or availability, please do not hesitate to contact us. Hi Sam and Emily. Please reserve another sampler for me. I’ll get the cash to you as soon as I can. Right on Rob, thank you!